Continuity, he explains, is the way to promote sustainability— and contrary to what the advocates of “modern architecture” claim, he insists that honoring the traditional ways of city building still provides a solid foundation for places to grow, evolve, be modern. However fond you are of your city, or however much you feel it needs improvement, this short collection of essays offers an enticing vision of the future. All of our cities have a past worth examining, a richness of experience that can shape the future in wonderful, surprising ways. Solomon’s prose is thought-provoking and inspiring, well worth keeping close by wherever you do your reading—be it your bedside, couch, a park, or on the metro. "Daniel Solomon…is a wonderful writer, with a quirky, far-ranging mind that can find a metaphor for city planning in the contrasting careers of Alice Waters and Julia Child." 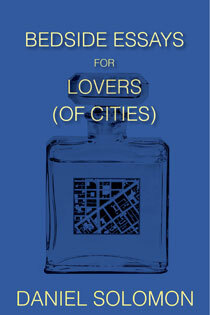 "[Bedside Essays for Lovers (of Cities)] is really a masterpiece of great clarity, power, passion, and wit… [It was] like catnip to me, repelling the mosquitoes, cockroaches, and termites that invade the finest of houses." Jonathan Cott, prolific author of "Pipers at the Gates of Dawn"
"If only all architects could write as engagingly as Daniel Solomon!" "Dan Solomon is the most entertaining and literate of the ever-growing body of people who think the modernist city was a bad idea. This wise, readable book, filled with poignant anecdotes and memorable insights, illumines the way to a saner future."